Think about your life's work. Now, pitch it to a complete stranger in a matter of seconds. One hundred and eighty seconds to be exact. That's the Three-Minute Thesis (3MT) in a nutshell. On April 5, 10 doctoral candidates at Carnegie Mellon University talked about their meaningful, even life-changing, research. They were not defending their research but rather showcasing their communication skills in a 3MT competition that rewards researchers who can give the clearest, most compelling explanations of their work. The University Libraries hosts the annual competition, which begins among dozens of doctoral candidates and culminates in a championship in CMU's McConomy Auditorium. Dean of Libraries Keith Webster brought the exercise from his former employer The University of Queensland in Australia, where the exercise was first developed. The idea has spread to universities worldwide. Pratiti Mandal of the College of Engineering is this year's champion. Open to all disciplines, about 300 doctoral candidates have risen to the challenge during its three years at CMU. "I do find the cross-disciplinary approach to be strong: we're not judging the quality of research, but rather a student's ability to communicate their work clearly and compellingly irrespective of field," Webster said. A couple of rules apply: namely the strict three-minute time limit and that participants may use a single, static slide as a visual aid. Judges evaluate the contestants on communication style, comprehension and engagement. "This year's finalists were all excellent," Webster said. "3MT has become part of the annual cycle at CMU, so students look ahead to the event, and take advantage of training opportunities organized by our colleagues in the CMU Global Communications Center, housed in the Hunt Library, and the student organization Public Communication for Researchers." Pratiti Mandal, from the College of Engineering, won the championship for her mechanical engineering solution to prevent the failure of fuel cells for alternative energy vehicles. 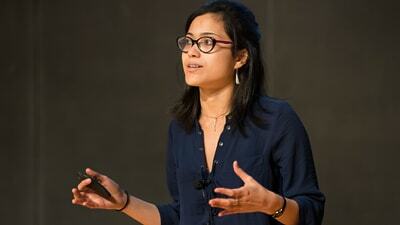 Her pitch hushed the audience when describing the problem of a car going powerless suddenly in the middle of traffic. Mandal gleaned the $3,000 first-place award and earned the $500 people's choice award, based on ballots submitted by the audience. Mandal prepared in the Global Communication Center, using videos of past 3MT speakers, and received moral support from other CMU students and alumni, including friends from the IGSA-Indian Graduate Students Association. Mandal said it was difficult to learn to talk about her research outside of her field, but she was gratified for the experience. "Science is not just for scientists to relish but for paying back to the society. It is of utmost importance to justify your research and contribution," she said. Juliann Reineke of the English Department tied for second place. A second place tie went to Shinjini Kundu in biomedical engineering, who spoke about training computers to detect osteoarthritis three years earlier than humans can, and Juliann Reineke in the Dietrich College's Department of English, who proposed a solution drawn from 18th-century literature for modern-day veterans reintegrating as civilians. Third place went to Amit Datta in electrical and computer engineering for his work on the use of personal data on the Web. Conference and travel grants of $2,000 and $1,000 went to the second and third-place finishers, respectively. Webster said competition was steep this year. He's seen an increase in the quality of presentations over the years and credits CMU faculty for encouraging more students to participate, as well as the availability online of recordings of past participants. Participation has its benefits. The Department of Statistics' Giuseppe Vinci, who admits to spending a great deal of time at the whiteboard in his office, was able to practice talking about the application of his statistical methods of network analysis in brain research. Jonathan Kush, from the Tepper School of Business, saw it as a chance to polish his elevator speech to future employers. The championship panel of judges was made up of CMU President Subra Suresh, Vice Provost for Education Amy Burkert, College of Fine Arts Dean Dan Martin, CMU Trustee and Executive Director of the Posner Fine Arts Foundation Anne Molloy, and Annie Arnold, chemistry graduate student and winner of the 2015 3MT title. 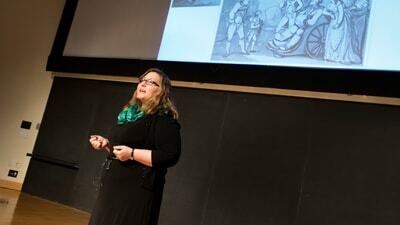 "The Three-Minute Thesis has been an excellent addition to our campus programming," Burkert said. "I enjoy participating each year because the competition offers a glimpse into the amazing work our graduate students are doing to make a positive impact in the world. "I also appreciate the fact that 3MT provides the opportunity for more of our doctoral students to enhance their ability to communicate their thesis work in an effective manner to a broad audience. Such a communication skillset is becoming even more important," Burkert said.